« Thinking out loud: PowerShell support for DB2? 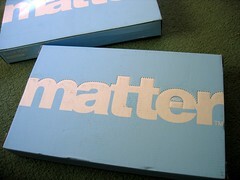 I signed up to matter a little while ago. It’s a service where you sign up to be sent promotional stuff. If you look at their website or their blog, they don’t really describe themselves like that. They talk about it as a “communications channel” between consumers and advertisers, and they talk about the “brand experience”. In fact, they say pretty much everything except “we’ll give you free stuff”. In the lead up to today, they’ve talked a lot about the care they’ve been taking to select interesting things that “you’ll want to keep”. Even so, my hopes weren’t very high. This is all free, so I was a little sceptical how good the stuff would be. 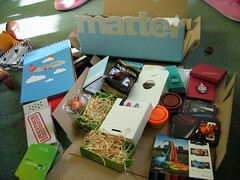 Today, the pilot matter box arrived. There is a lot of attention to detail. Even the delivery time has been carefully considered – arriving on a Saturday morning to allow for the sort of experience they want to create. I must admit, I thought that sounded a little pretentious when I first read that, but in hindsight, they are on to something here. Afterwards, we could play with Grace making things out of the playdoh, and with the little music monsters. The whole thing wouldn’t have been the same if it had arrived on a morning when we were trying to get ready for work and get Grace ready for nursery. So what about the things in the box? A wristband from Nintendo, with “Wii” embroidered on it… presumably promoting the idea you get exercise when you play Wii games. Or perhaps part of the promotion for the still-unreleased-in-the-UK Wii Fit? Soap crayons from Nissan – “soap you can write with? or crayons you can wash with?” – promoting the Nissan brand message of innovation and combining ideas in new and refreshing ways. A box of cereal from Jordans, in a box styled like a Penguin paperback book. This one was interesting – wasn’t quite sure what they were trying to say here. Is Jordans pitching themselves as a breakfast brand for intellectuals? Or is it a “nutrition for the body, nutrition for the mind” kinda thing? Enjoy a healthy breakfast while you read the Jerome K Jerome extract on the back of the box. Either way, it was kinda neat… and the breakfast was nice. 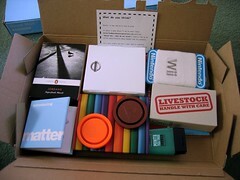 The box also included a web link to request a sample of Macho Muesli, which is a very surreal idea! A calendar from Virgin Atlantic. Fairly straightforward, but it will certainly be useful to have a calendar on my desk again – I hadn’t got round to getting a 2008 one yet – and the flappy-out bits are quite nice. A metal pin badge from Stollchnaya vodka in a little book with notable Russian achievements. All in all, kinda neat. The attention to detail is evident in the collection. You do get the feeling that thought did go into it – it isn’t just a “ah, it’s free – let’s just lob in everything we can find” sort of thing. One last thought – Royal Mail’s involvement was interesting. On the matter website, they talk about how that, in an increasingly “virtual world”, physical tangible objects have acquired something of a premium. In a time of spam sprayed out in the millions, and banner adverts and pop-ups plastered on every site you visit, there is something a little special about an advertiser taking the time to send you an actual physical object. And this is certainly something well-suited to making Royal Mail more relevant when increasingly we prefer to send things by email. They talk about the unique access that Royal Mail has to every household in the UK. matter is a chance for advertisers to “exploit” this. Update: I see that Andy and James got matter boxes today, as well. Andy’s done his review in video form, which is worth a watch. I wish I’d thought of that… I wanted to try the video blog thing more, especially now that I’ve got a Seesmic account. This entry was posted on Saturday, February 2nd, 2008 at 7:52 pm and is filed under kids, misc. You can follow any responses to this entry through the RSS 2.0 feed. Both comments and pings are currently closed. 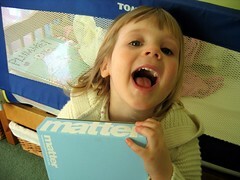 I, too, wrote a post on matterbox, but I didn’t have such adorable pics of a sweet little girl playing with the box! 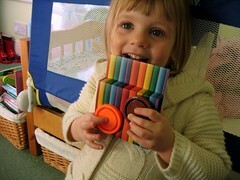 Dale ~ just wanted to let you know that your picture of Grace with the Matter Box is perfect for sending the NOTCOT readers into jealous fits over your awesome box! ps. 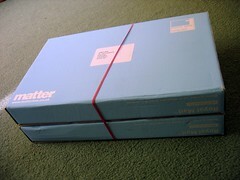 do matter send to australia? @jack – sorry, no can do. The way the two boxes arrived tied together meant we assumed at first that the stuff was split between the two boxes – and opened them both. 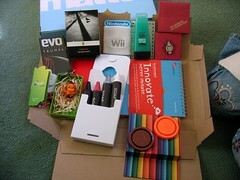 And most of the stuff in the second box has already found a home! sorry! No idea if matter ship overseas, though. I got this too – not sure how I was signed up, but glad I am. Love the wristband and the Stoli lapel badge. Has anyone read the last page of the Stoly book as it sends you to a website with a clue where you can ‘join a party’. Says nothing about what this may be or if you get anything tho. @Johnson A lot of the items have, or point to, online material. I like that. For an approach that tries to highlight the value of physical rather than virtual collateral, they’ve still come up with ways to combine both. I had to post this on my freebie site. Such a great idea.